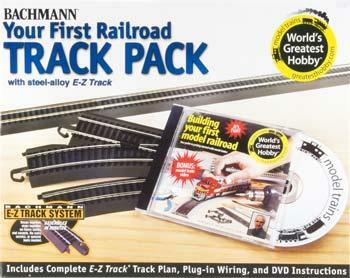 This is the "Your First Railroad Track Pack" by Bachmann. Suitable for Ages 8 & Older. Retail $219.00 SAVE 34% ! This 45-piece track pack has all the E-Z Track snap-fit track (with molded roadbed) you'll need to build the layout featured on the enclosed DVD: "Building Your First Model Railroad" hosted by Michael Gross E-Z Track features snap-fit assembly, clear tie spacing, low-profile spike heads and modeled from AAR track engineering dimensions Includes E-Z Track track plan, plug-in wiring and DVD instructions Easy track assembly. no nails, screws, or special tools needed Detailed printed instructions provided. Part of the World's Greatest Hobby promotion campaign.